Sister Rose Marie Vogel, (Sister Mary Ronald) CSJ, 78, died Sunday, May 24, 2015, in the 61st year of her religious life as a Sister of St. Joseph. The daughter of Erhard and Rose Marie Harlan Vogel, Sister Rose Marie entered the Congregation from St. John Parish, Johnstown, PA. For 26 years Sister ministered in the field of education as principal and teacher in the Pittsburgh, Greensburg, and Altoona Johnstown Dioceses, including 6 years as principal of St. Joseph School in New Kensington. From 1985-2006 Sister Rose Marie served first as chaplain at Mercy Hospital, and then at Good Samaritan Medical Center and Conemaugh Health System in Johnstown. She continued to volunteer as chaplain at Conemaugh Health System from 2006-2012. 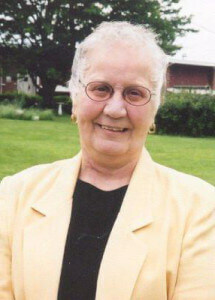 In 2003 Sister Rose Marie was presented the Prince Gallitzin Cross by Bishop Joseph Adamec for her service to the Diocesan Church of Altoona Johnstown. After teaching bible studies at Valley Pike Manor in Johnstown for a short period of time, Sister came to the Motherhouse where she continued to care for others through her prayer ministry and briefly as Medical Transport Manager. Sister Rosie was fun loving and had a great sense of humor. Throughout her life, she touched the lives of many through her compassion and generosity. She will be especially remembered for her comforting presence to the sick, the dying and the bereaved. Sr. Rose Marie is survived by a sister, Norene Pozniak of State College, PA, a step-sister, Mary Kaye Tacik of Johnstown, PA, a brother, Ronald (Carole) of Johnstown, PA, nieces and nephews, grandnieces and grandnephews, and the Sisters of St. Joseph of Baden. Friends will be received Wednesday from 1-8 p.m. and Thursday from 11:00:-3:30 p.m. at the Motherhouse of the Sisters of St. Joseph in Baden. Mass of Christian Burial will be offered in the Motherhouse Chapel Thursday at 4:00 p.m. in the Motherhouse Chapel. Burial will follow in the Sisters’ Cemetery on the Motherhouse grounds. Make a donation in memory of Sister Rose Marie.